The Urban Politico: Did the Obama Administration Flip Flop on Miranda? Did the Obama Administration Flip Flop on Miranda? The Obama administration said Sunday it would seek a law allowing investigators to interrogate terrorism suspects without informing them of their rights, as Attorney General Eric H. Holder Jr. flatly asserted that the defendant in the Times Square bombing attempt was trained by the Taliban in Pakistan. 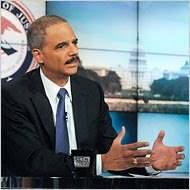 Mr. Holder proposed carving out a broad new exception to the Miranda rights established in a landmark 1966 Supreme Court ruling. It didn't take long before other media sources (mostly liberal) seized upon Holder's interview and demonized the Obama Administration for attempting to "take away people's Miranda rights" with this "brand new exception." There's only one problem: Holder never said any of that. (2) That through this new rule, investigators will be able to interrogate suspects without informing them of their rights. Period. End of story. Holder: "What you do is use the 'public safety exception' that the Supreme Court has defined to make sure that there are no immediate threats..."
"We certainly need more flexibility and we want the public safety exception (as in that same exception that was mentioned at 0:59) to be consistent with the public safety concerns that we now have in the 21st century as opposed to the public safety concerns that we had in the 1980's." The reason why Holder specifically references the "1980's" here is because, once again, he is referring to the 1984 case New York v. Quarles which David Gregory doesn't seem to pick up on or be interested in acknowledging. Instead, during the interview with Holder, Gregory seems to be more concerned with sensationalizing the idea of a "brand new" exception to the Miranda Warning as if he's just discovered Al Capone's vault. In reality, what Holder is actually saying is that the Obama Administration would like to work with Congress to merely codify the ruling in New York v. Quarles with modern language. That's it. No more, no less. Therefore in sum, I have to call foul on the Times (sorry to all you Times fans out there) and I also have to call foul on certain liberal pundits who have been all too eager to characterize this law enforcement policy as something that it clearly is not. Let's all take a breather. Nobody is talking about taking Miranda rights away from the people. In fact, to be completely honest, we're not even talking about doing anything new here; this safety exception has been used by law enforcement for over 20 years now. Miranda is still solid law in America and the Supreme Court has indicated on several occasions that there's not too much any of us can do to change that fact. Case in point, in Dickerson v. U.S., one of the most conservative Supreme Court Justices we've ever had, Chief Justice William Rehnquist, had a chance to throw out the Miranda rule once and for all. When presented with the option between protecting the Miranda rule or allowing Congress to erase it off the books, he said, and I quote: "We hold that Miranda, being a constitutional decision of this Court, may not be...overruled by an Act of Congress, and we decline to overrule Miranda ourselves."